Wolf Kahn brings the pure hot color of Abstract Expressionism to an idea of landscape that is tranquil, reflective, and (as his titles tell us) witty. He scans what is before him for patterns, for broad and sometimes astonishing contrasts. He brings back from his survey of natural colors – magentas, purples, orange-pinks – that must be seen to be believed. We do believe them; his images keep a sense of place and moment, though what strikes us first is their abstract gorgeousness. Gorgeous, but they do not leave the earth. The art of Wolf Kahn is distinguished by gorgeous colors and an engaging presentness. Equally an abstract artist and a landscape painter, Kahn begins with nature to construct a pictorial gestalt that conveys the experience of a particular place at a particular time. Using the movement of color to evoke the ever-changing character of all landscapes, he represents the relationship of the observer to the observed, and of space to form. Every work has a distinct emotional tone derived from the tension between overall painterliness, structural logic, and subject. In this exhibition, which includes works dating from 1958 to 2003 – a period of forty-five years – we do not see a linear development, but rather an evolution of enrichment. Kahn’s more abstract and more realistic works are part of the same continuum that is constantly changing because he doesn’t want to paint what he already knows. Along with looking intensely at the varied landscapes of Italy, New England, Florida, and Namibia, Wolf Kahn has looked hard at other painters who have based their art most fundamentally on color and light: Turner, Monet, Bonnard, and Matisse, as well as Hans Hofmann with whom he studied form 1947 to 1948. He learned very specific things from his chosen influences and deliberately incorporated them into his philosophy and methodology. Kahn emulated “Bonnard’s sweetness” and wanted to achieve “the radiance of Rothko’s best paintings.” Hans Homann’s teaching, “to use nature as a jumping off point…to view space as a whole rather than as a series of details,” and to invent different ways of organizing the pictorial field of a painting remains central to his process. Kahn admired de Kooning’s freedom of gesture, and still today wants his painting to look effortless. Kahn’s practice was informed by the Abstract Expressionist notion of painting as a heroic act, and of the artist as a visionary. Speaking with great seriousness eh says that it is his “job to show the world something they have never seen before.” Although he considers the transformative powers of art to be magical, he is also a formalist who enjoys the visual mind games he plays during the process of painting. Wolf Kahn’s paintings are about the act of seeing and the process of making a painting. Each work is carefully constructed re-presentation of his field of vision into a field of color and light. Beginning with outdoor pastel sketches and/or photographs, he completes the paintings in his studio – often having as many as thirty works going at once. Kahn composes his works with rigorous attention to geometric order, color interrelationships, and paint application. With a wide repertoire of brushwork and daring chromatic range, he changes his subjects frequently, never completely abandoning any of his approaches. Venice in Autumn, the earliest painting in this exhibition, is Kahn’s depiction of “a field of white light,” as he and his wife, painter Emily Mason, saw it, looking across the Marittima of Venice on a foggy day in 1958. Long views over water with hovering signs of land in the distance remained a frequent subject, and works with loosely brushed color, with gradations that both suggest and deny spatial illusion, appear intermittently throughout his oeuvre. Such planar color fields become increasingly atmospheric in works Off Deer Isle (1966), and more palpable in Atlantic (2002) and The Rain in Maine (2003). A very different kind of painting – that of all over gestures capturing patterns of light and dark – found in On Martha’s Vineyard, Summer 1962 and Eagle Island, ME (1963) has much in common with that of his contemporaries Philip Guston, Milton Resnick and Joan Mitchel who, like Kahn, were part of the New York scene. Later in the sixties, Kahn’s lively strokes of color were more broadly brushed and thickly applied, becoming heavily built up impenetrable surfaces. In 2001, during a trip to Africa, thornbushes, with densely interwoven branches, gave him an opportunity to accurately capture the colors and patterns of nature while celebrating the act of painting. Barns are a frequent, and popular subject in Kahn’s work since 1962. Chosen because of their minimal form and their familiarity as an American icon, their depiction is always stylized into the juxtaposition of broad color planes. The buildings in the dark brooding Study for “First Barn” Painting and vibrant Deep Purple Barn from 2003 fill shallow space with a confrontational and uncompromising image. Since the seventies, Kahn has represented stands of trees that stretch across the canvas, parallel to the picture plane. In works of the last two years, the trees are shown up close, often without their top branches, as a rhythmical screen of light and dark, form and space, vertical and horizontal. Atmospheric and dynamic color are combined in representations that are firmly rooted in reality but highly conceptual. With great conviction, in different styles, Wolf Kahn’s art always communicates his joy in the act of painting. You feel the measured energy of his brushstrokes and share his delight in deploying colors that differ in saturation and hue. Kahn modulates color and paint application, making sure that every inch of the canvas is pictorially activated. As is evident in this exhibition, certain tonalities dominate at particular periods in his art, but light is always central to his representations. Throughout Kahn’s career, color is alternatively, spatial, gestural and planar. His most recent works combine all three. Wolf Kahn is a highly original colorist who differs from Abstract Expressionists and color field painters in his refusal to abandon nature. No matter how abstract his final vision, we are convinced that Kahn paints what he sees and that he emphasizes with the landscapes which he selects for consideration. His paintings are sensuous and cerebral, fact and fiction. They are unique in the strength of their images and the clarity of their gestures. 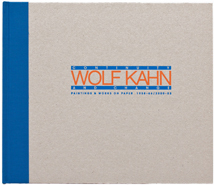 Our experience of looking at Wolf Kahn’s work is a journey, an education, and a great pleasure.